The card built on choice. Building your own rewards program allows you to maximize the TouchPoints you earn based on how you spend your money. With MyChoice by ADCB there’s finally a card that gives you the flexibility to earn rewards in the categories you buy the most so you can spend them on the things you want. You have the flexibility to choose from the available variants which include Platinum, Titanium, Gold and Classic cards. For Platinum Card holders 60,000 TouchPoints is awarded as welcome bonus once in a lifetime i.e. a customer will not earn 60,000 points twice even if the card is cancelled. Welcome bonus TouchPoints are awarded upon payment of annual fee during first year only. With MyChoice, you get to choose the rewards that fit your life. Enjoy the freedom of choosing how you want to earn and spend your rewards while continuing to earn TouchPoints. Choose one category or choose them all, the choice is yours. To enjoy the MyChoice bonus rewards, simply make total purchases worth AED 2,500 every month for each of the enrolled categories. Please note that your total purchases include your purchases within the chosen category as well all other purchases during the month. For example, if you enroll for Supermarket and Telecom reward categories, you will be required to make total overall purchases on the card worth AED 5,000 or more to be eligible for the bonus rewards. The bonus rewards will be applied to the purchases within the selected reward category. What’s more, purchases with your TouchPoints Credit Card will still earn rewards at 1, 0.75 & 0.5 TouchPoints for every AED 1 worth of eligible purchase with Platinum, Titanium/Gold and Standard card respectively. How do I enroll for MyChoice? To select your rewards category, simply login to Personal Internet Banking or call our 24/7 Contact Centre at 600 50 2030. Please note that all preferences registered until 10th of the month will be applicable for the current month while those made later will be applicable from the next month onwards. What can you do with your TouchPoints? You can accumulate your TouchPoints over a period of time and redeem them for shopping or dining vouchers, airline tickets and upgrades, paying your utility bills and much more. Enjoy a free movie ticket when you buy one with your ADCB TouchPoints Credit Card! Feature valid on 2D, 3D and IMAX movie ticket purchases made with your ADCB TouchPoints Credit Card through the VOX Cinemas website or the VOX Cinemas Mobile App. Simply sign up as a member at VOXCinemas.com to avail this offer! Travel with your TouchPoints Platinum Credit Card and enjoy a richer experience than before. As a Platinum Card member, you enjoy 3 complimentary access to premium airport lounges across the many cities where you love to travel every year. For online primary and supplementary card registration and for the latest updated list of lounges visit www.adcb.com/lounge. Tee off in style with your TouchPoints Platinum Credit Card. As a Platinum card member, you have the luxury of playing golf for free all year at The Track, Meydan Golf Dubai, Arabian Ranches Golf Club Dubai and Yas Links Golf Club Abu Dhabi. Just spend AED 5,000 on your credit card every month to enjoy uninterrupted access. Reservations are mandatory and available on a first come first serve basis for up to 14 days in advance. To book tee times, call us toll free on 600 5 02004. Benefits at Ferrari World Abu Dhabi , Yas Waterworld and Warner Brothers World Abu Dhabi. Indulge yourself with a host of privileges on tickets, merchandise, food and beverages at Ferrari World Abu Dhabi, Yas Waterworld and Warner Brothers World Abu Dhabi. • 15% discount on General Admission Tickets and annual passes purchased at the park ticketing counters. Savour the best of fine dining in the country with dining privileges of 25% off at the finest selection of upmarket restaurants and eateries in the UAE. Manage your credit card account 24/7 with our multi-functional Mobile App and Personal Internet Banking. Pay all your utility bills, mobile phone bills, school & college fee payments, Salik, credit card payments, redeem TouchPoints – all through the comfort of your home or office. An optional insurance plan which covers your card outstanding for upto AED 100,000 against any untoward incidents like Critical Illness, Natural Death, Permanent Total Disablement, Involuntary Loss of Employment at a nominal charge. • Personal Internet Banking- click on the “Credit Card Payment” option under the “Credit Card” menu. Alternatively, you can make payments at ENOC/EPPCO, Al Ansari Exchange, UAE Exchange or at LuLu Exchange branches. A nominal transaction fee of AED 5 per payment transaction will be charged for bill payments through partner payment locations such as exchange houses and ENOC / EPPCO locations. Save immensely on interest expenses when you transfer your outstanding balances from other bank credit cards to an ADCB credit card. You also earn the flexibility to repay upto 12 months. Need cash against your available credit limit? Simply call us and the money will be transferred to your account within 3 working days. Benefit from a low interest rate and repay in easy instalments of upto 24 months. Beat the stress of paying back any of your high value purchases by splitting transactions into easy installment plans at low interest rates and tenors of upto 24 months. At our wide range of partner locations, you can shop and pay back in installments at zero interest charges. Choose from hundreds of complimentary offers throughout Middle East & Africa across fine dining establishments, premium spas, and more when paying with your ADCB TouchPoints Credit Card. Download Mastercard Buy 1 Get 1 from the App Store or Google Play Store and register with your card details to get access to over 900 unlimited usage offers. 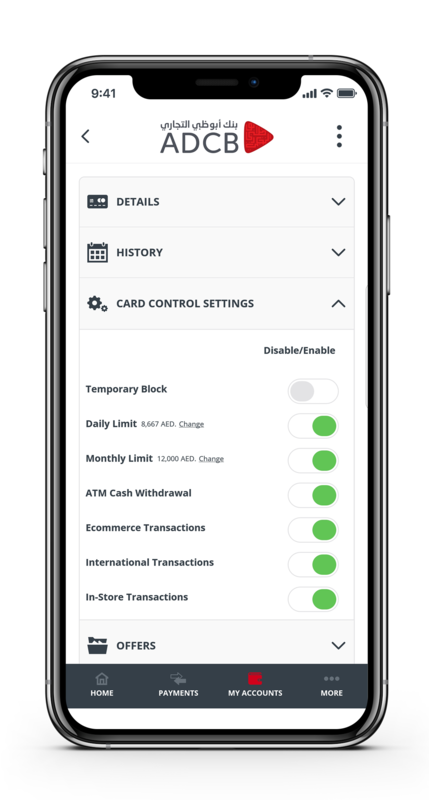 Enjoy complete control of your card transactions and set spend limits with the Card Control feature through the ADCB Mobile App. For detailed Terms and Conditions on each of the features and benefits provided on your ADCB Credit Card, please visit adcb.com or call 600 50 2030. All terms and Conditions are subject to change without prior notice. All offers are made available on best effort basis and at the sole discretion of ADCB. ADCB makes no warranties and assumes no liability in respect to the products and services provided by the vendors/partners/service providers.